Is a Mirliton an instrument, a dance movement or vegetable? Actually, the answer is, "all three", but this page is about the vegetable pear - How to grow it, how to cook it and even festivals that honor it. 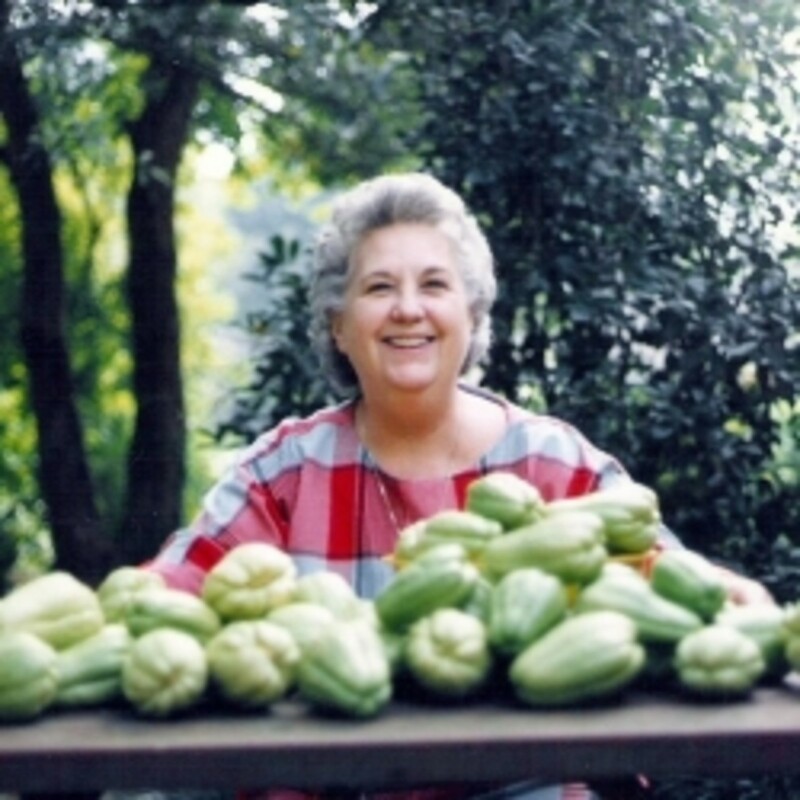 Other names for this unique vegetable include: chayote, mango squash, chuchu, sayote, tayota, choko, chocho, chow-chow, and pear squash. Mirlitons are an integral part of old New Orleans cooking. 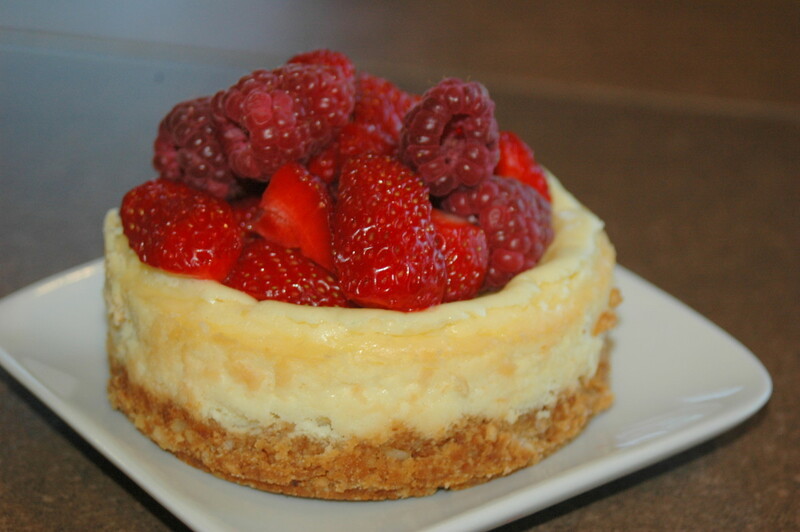 Here you'll find easy recipes for all sorts of mirliton dishes and links to many more. If you have a bumper crop of mirlitons this year, then this page should keep you stocked with a variety of ways to use them. There are also other great New Orleans and South Louisiana recipes here. 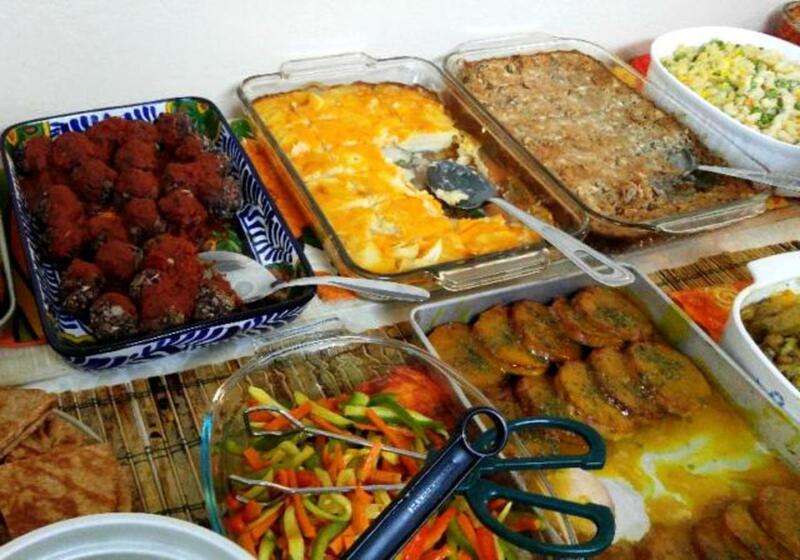 In New Orleans, you can't have Thanksgiving or Christmas dinner without at least one dish containing mirlitons. If you aren't from south Louisiana you may wonder, "what in the world are mirlitons?" If you are a musician, then images of musical instruments probably pop into your head, but you'd be wrong. Mirliton (in N'Awlinese pronounced MEL-a-tahn, DAHlin') is the name of a type of fleshy, mild tasting tropical squash-like fruit that is a member of the cucumber family. Other names for this pear shaped delight are vegetable pear, chayote, mango squash and several other odd names. Mirliton vines crawl all over backyards in New Orleans and other parts of South Louisiana and are relatively easy to grow if you have the right place, a good amount of rain and the summer is not too hot. 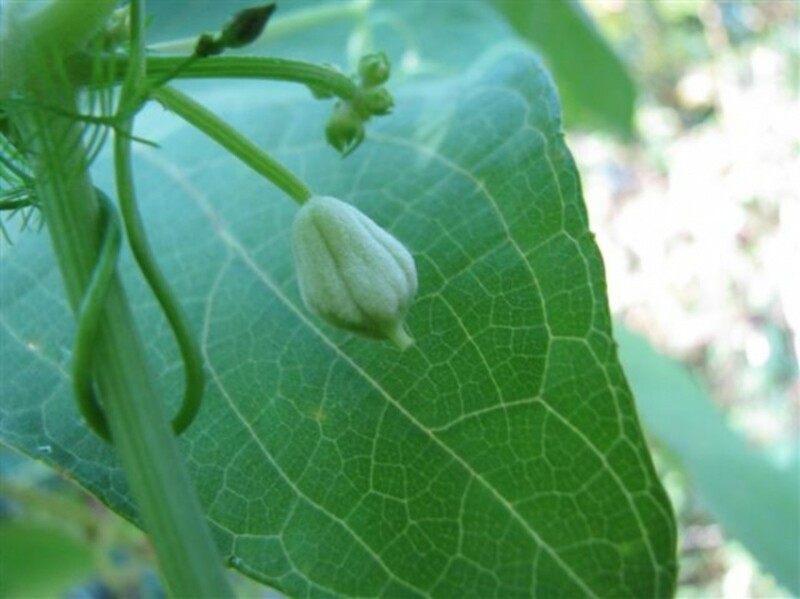 The mirliton vine sets flowers in September and begins bearing fruit in October, if the weather cooperates and cools off early enough in the fall. Besides being a truly beautiful person with a kind and loving heart, my lovely Mother-in-law was the queen of the mirliton chefs. Her stuffed mirliton casserole was the best, even by New Orleans' high standards. She finally showed me how to prepare this delicious dish after I had been married to her son for a few years. I'm going to share Dottie's secret recipe and many others with you and you don't even have to marry her son! For those gardeners, who'd like to try their hand at growing this long season plant, I'll give you some basic information and links to get you started and in the fall you'll have hundreds of vegetable pears to enjoy and to give away to friends and family. Simmer mirlitons in salted water until tender, about 1 to 1 1/4 hours. Remove, drain and reserve about 1 cup of the water. Cut the mirlitons in half; remove the seeds and carefully spoon out the pulp. (Dottie just put her stuffing into a casserole dish, but many people stuff the mirliton shells.) Set the shells aside if you want to stuff them. Chop pulp and add bread crumbs. Sauté onions, garlic and shrimp or meat of your choice in butter over medium heat until tender, about 10 to 15 minutes. Stir in pulp mixture, salt and pepper; continue cooking for 5 minutes, stirring frequently. (If it is too dry, add a little of the reserved mirliton boiling water.) Cool a little and add parsley and thyme and mix thoroughly. 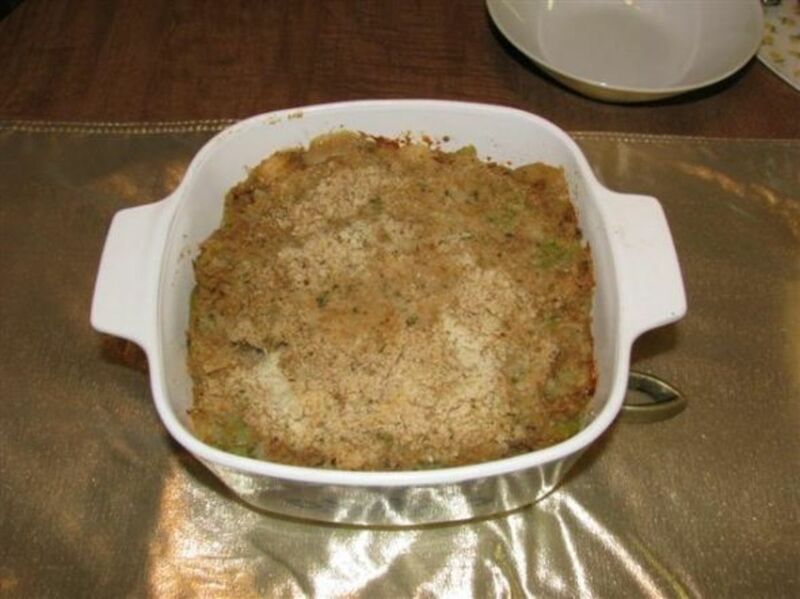 Fill vegetable shells or shallow casserole dish with pulp mixture and sprinkle tops with buttered crumbs. Bake in 375 degree F oven for 25 minutes. Serves 8. Variation: Add 1/4 cup of grated Parmesan cheese with the parsley and thyme mixture and sprinkle a little Parmesan on top with the buttered breadcrumbs. Combine mirliton, brown sugar, eggs, vanilla and spices. Stir in milk, sugar, flour and butter. Add raisins and pecans. Pour into buttered 1 1/2 quart casserole. Bake in 350 degree F oven for one hour or until mixture is set. Serves 6. Peel and cube mirliton. Sauté with onion in sizzling butter over low heat until tender, about 20 minutes. Do not add water. Season with salt and pepper. Serves 4. In 1 1/2 quart casserole, layer mirlitons, onion, green peppers and white sauce. Cover with crumbs, dot with butter. Bake in 350 degree F oven for 20 minutes. Serves 4. White Sauce: Melt 3 tablespoons butter over low heat; blend in 3 tablespoons flour and 1/4 teaspoon salt. Gradually add 1 1/4 cups milk, stirring constantly. Cook until thick and smooth. Makes 1 1/2 cups. Dottie cut these out of the paper. 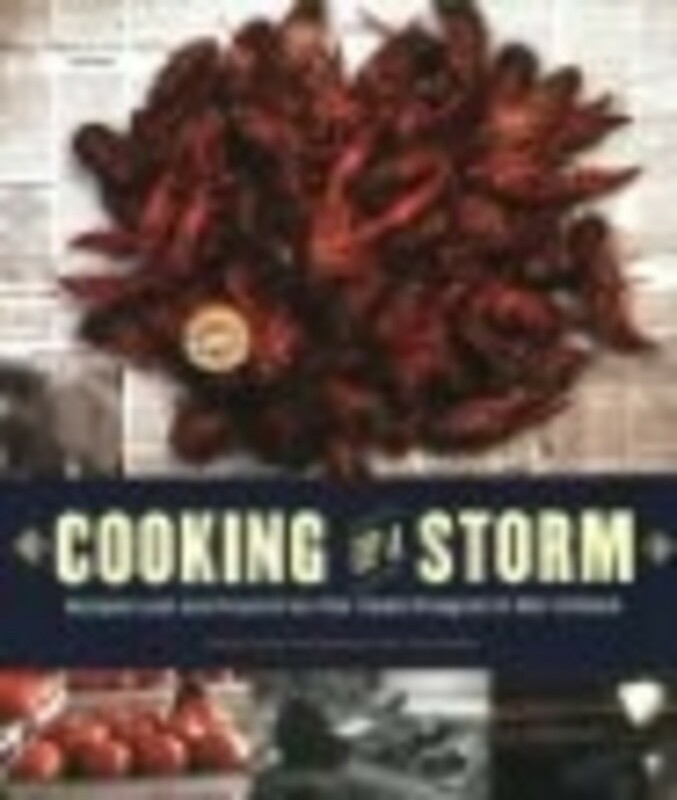 This cookbook was created for all of those who lost their stash of recipes because of Hurricane Katrina. I still have Dottie's recipe file with all of her Times Picayune clippings. 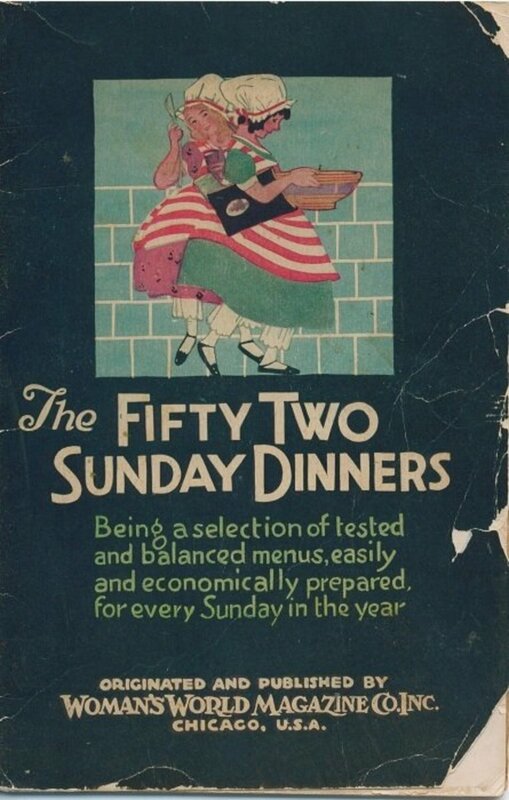 This cookbook is almost as good as her file. It just doesn't have the notes written in her hand. Home for the Holidays Contest in the Holiday Cooking category, December, 2008.
can range anywhere from a few ounces to more than two pounds. The vegetable pear, also called mirliton, chayote or mango squash, is a member of the cucumber family that produces delicious one-seed fruit in the fall. 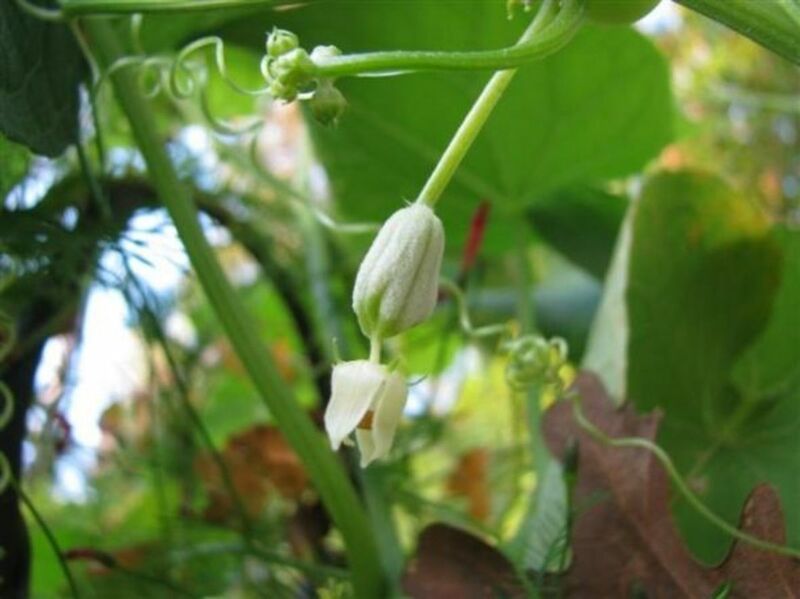 This vining plant resembles cucumbers, but is much more vigorous in growth and more prolific in fruit production. 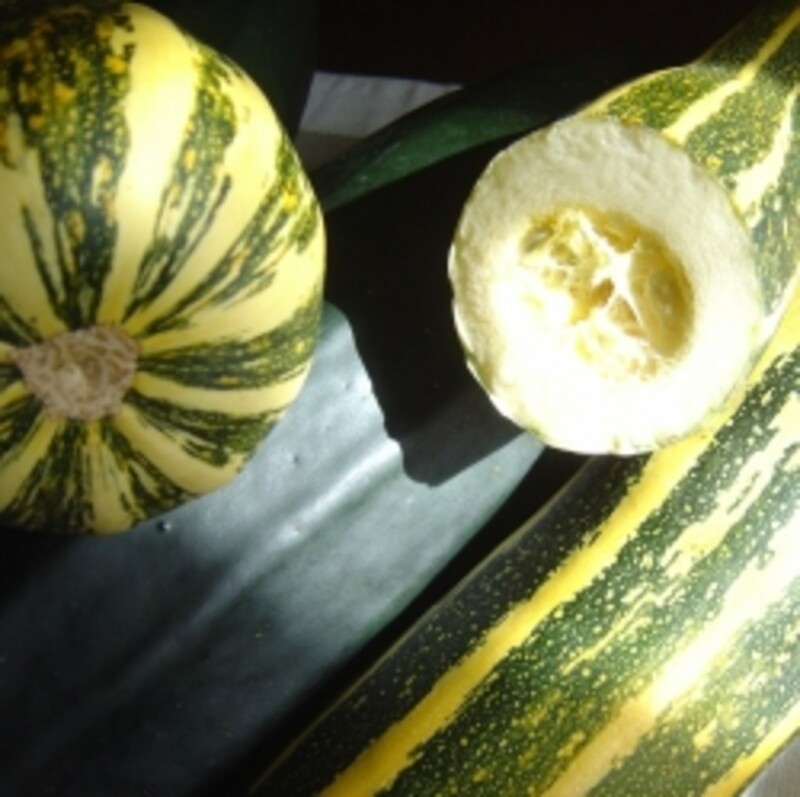 The fruit has a flavor similar to squash and is used much like squash in recipes. 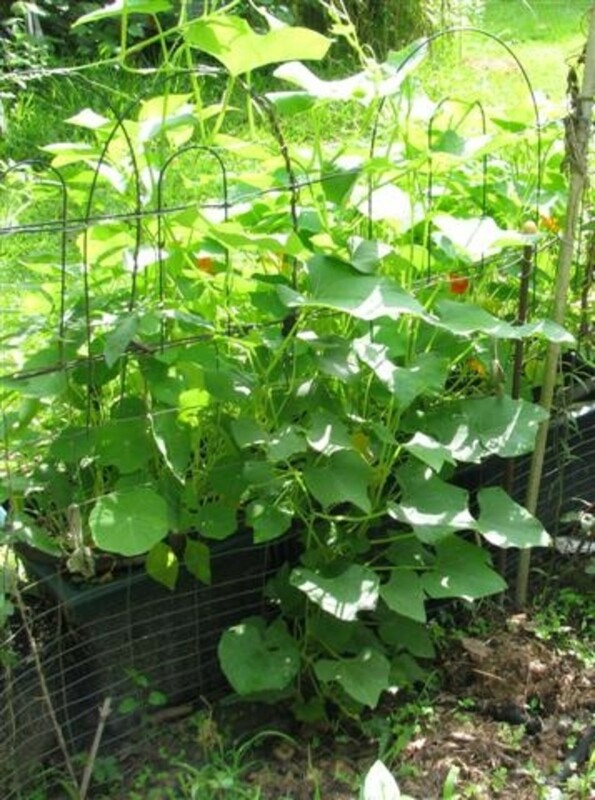 The vegetable pear will grow in any section of the state (Louisiana). It is a perennial and will renew its growth from the roots each year if protected from freezing. It requires a well-drained, highly fertile soil with lots of organic matter. In ideal growing conditions, a single vine in the yard or garden will produce more than enough fruit for the average family. The plants require days in which the number of hours of daylight are 12 or more to begin blooming and setting fruit. Normally, fruiting begins in September and continues until frost. Occasionally in the spring, if the plant makes enough vegetative growth by May, a few fruit will set and develop a late spring crop. The main crop is produced in the fall. Recently we have received new information about growing mirlitons. It seems that to grow them successfully, you must start with mirlitons that were grown in south Louisiana, not ones that you buy in the grocery that come from South America or other countries. After Hurricane Katrina, it was very hard to find locally grown mirlitons to get a start, but now they are making a comeback and they are easier to find. Mirlitons are easy to plant. All you have to do is lay one of the fruits down on its side and cover it with dirt. The plant comes out of the fat end from a single "seed" that is inside. We start ours in the greenhouse during winter and then plant them out when all danger of frost has past. They will even start sprouting vines while they are inside the house, sitting on the counter. You can plant these, too. 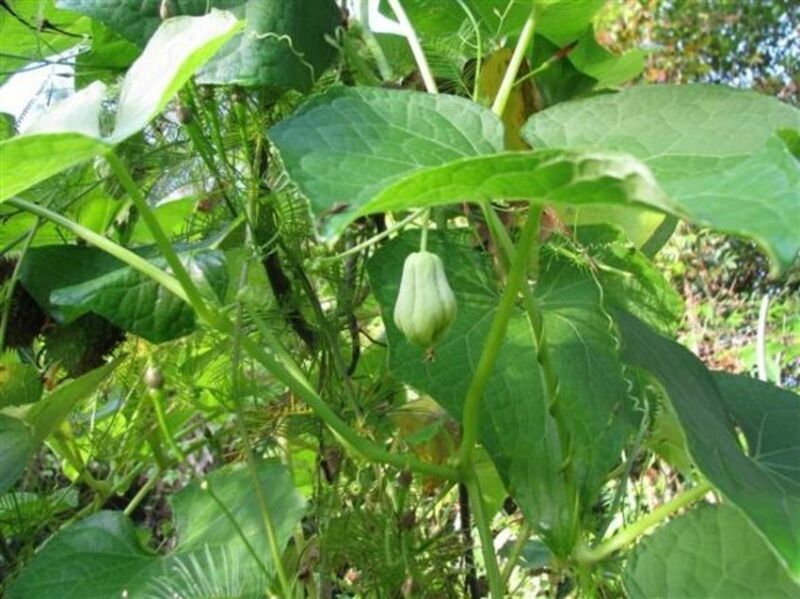 A single vine may produce as many as 100 one-pound mirlitons. We found a grower at the local Farmer's Market who grew mirlitons from stock which originated in New Orleans. We purchased 4 mirlitons and eventually planted them in large pots and kept them in the greenhouse until spring. We thought that we had waited too long to plant them, because while they were inside, they began to sprout and Dax, our 18 pound orange cat, thought that the sprouts were a very tasty treat. He kept "pruning" them back for us. To our surprise, this actually helped the plants to form bushy vines with many branches. In May, we planted them out in the garden in soil enriched with chicken manure and compost. We are watering them well during dry periods and our hopes are high. 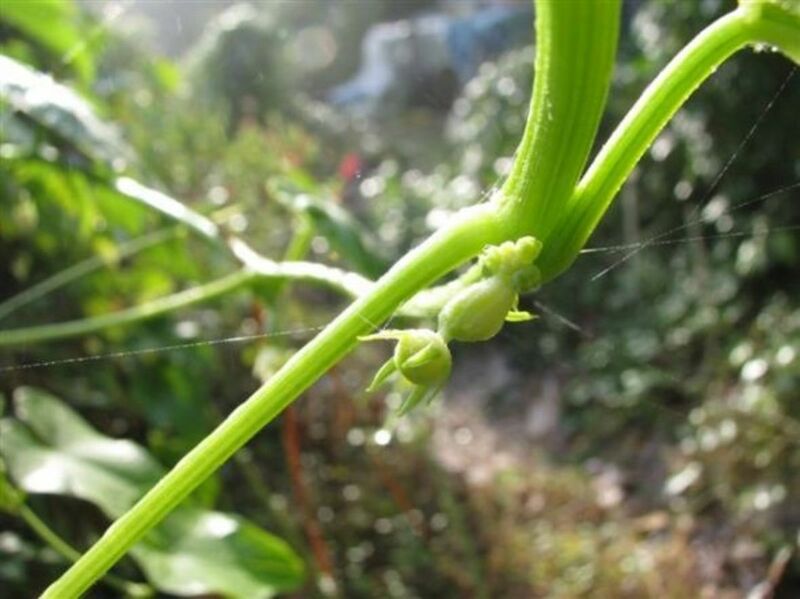 In July, I thought I saw what looked like the beginning of a flower bud on a couple of them. 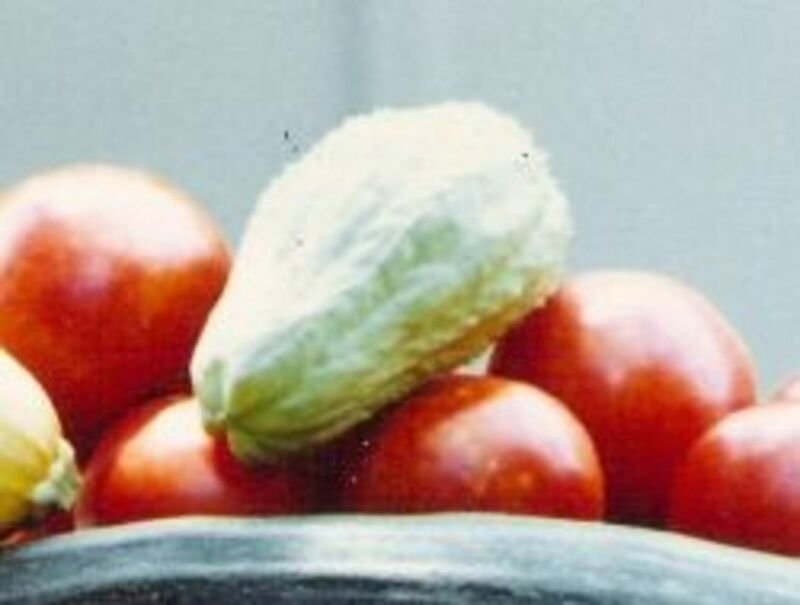 For more information about growing and cooking mirlitons, visit our HubPage, Mirliton from the Garden to the Table. Growing Mirlitons Photos - Click on the small photos to enlarge. 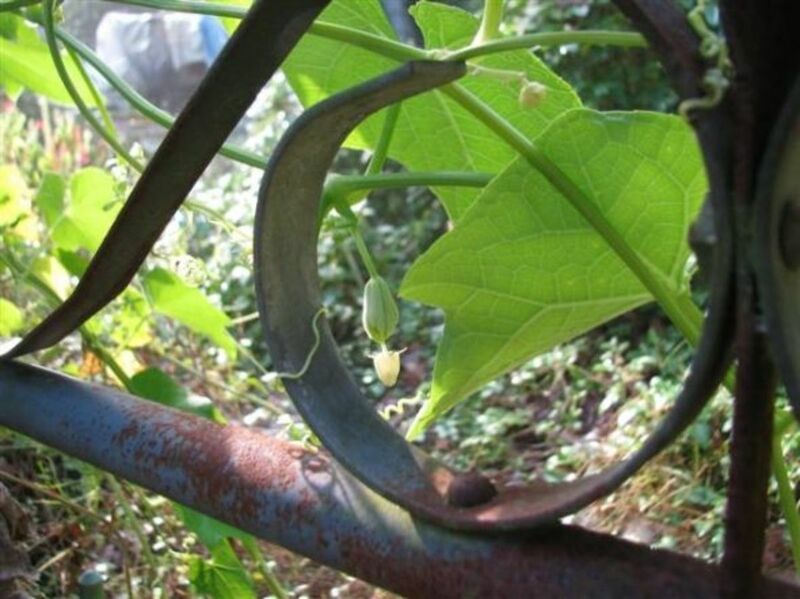 Mirliton Vine on garden gate with a female flower bud about to open. Tiny new female flower bud. The flower opens. This will female bloom will make a mirliton. The flower bloom drops off. The young mirlitons grow and mature. What do you think about mirlitons now? 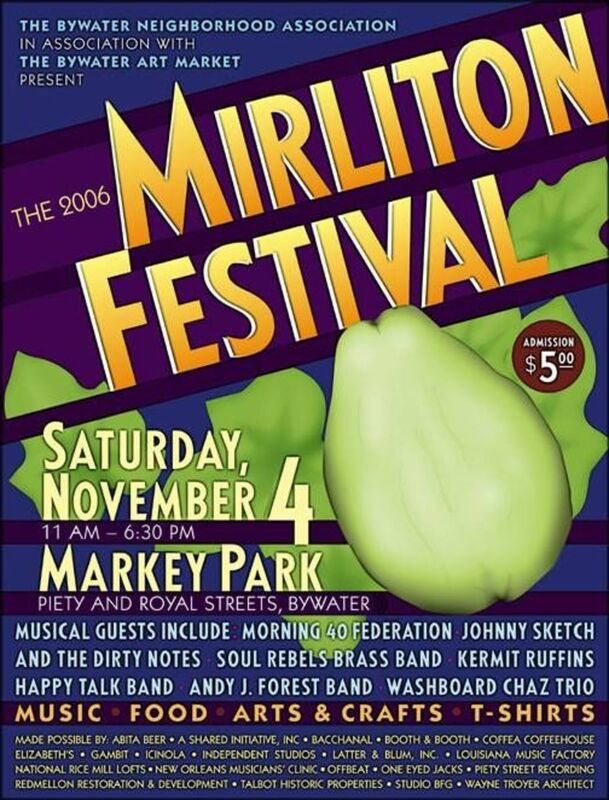 New Orleans is so crazy about mirlitons that there is a festival each year sponsored by the The Bywater Neighborhood Association in association with The Bywater Art Market. Food, Fun, Music and Art, what a great combination! I've never heard of mirlitons, but would like to try them. I enjoyed reading about them and learning something new. Wow! Brilliant hub. I've been lucky enough to visit New Orleans three times in my life (would LOVE to go back!) but have never heard of mirlitons. I've never heard of a mirliton before. I wish we could get them here. It would be a good experiment. Wonderful, I love creole cooking and I've overlooked these, I'll try some to get some plants from my nursery to grow up and eat. Thanks for the post! 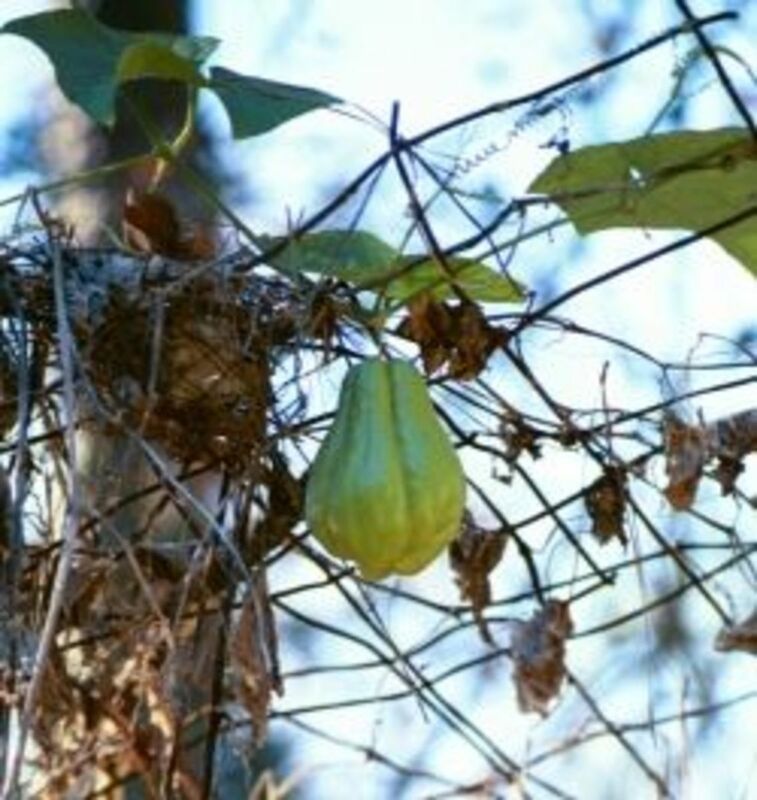 Mirlitons are making a comeback since H. Katrina destroyed many of the local vines that grew so well in south Louisiana. The imported ones that are sold in the big stores just don't grow well here. I've been able to find some of the old New Orleans stock and hope to have a good crop next year. I have never, ever heard of this before but I think I'd love it. I know we're not in Mirliton growing country (Minnesota is polar opposite of Louisiana climate-wise, I'm sure) but I'm just ornery enough to give this a try. Bookmarking this as a reference...thanks! This was totally new to me - I love learning new things btw :) These recipes look and sound really delicious, thanks for sharing. Mirlitons are easy to grow. When there are no more frosts, you can lay one (that you get from the market) down on its side and cover it with dirt. The plant will grow out of the big end sort of like a potato. The whole thing is a seed! We start them in pots in the greenhouse in winter, then transplant them to the garden in spring. Thanks for adding this to the All about growing food group. I had never heard of the Mirliton although I think I may have seen it in a local world food grocery - not sure how I could find the seeds for it here in the UK either. How about adding a module with links to buy seeds? Good revenue for you too if you find the right way. What a fabulous page. I was referred here by SusannaDuffy who thought you'd make a wonderful addition to our brand new New Orleans Group. Please join us! Mirlitons are all over the market right now, going to try your mother-in-laws recipe...loks delicious. Thanks for participating in the A Month of Hope Challenge! Keep up the great work! Mmmmm...now I'm hungry I now know what a mirliton is. Cool! I've never been to New Orleans but if I went, I would probably spend the whole time eating. The food sounds wonderful. Congratulations on winning the Squidinner recipe contest. I had never heard of mirlitons before. I was scratching my head wondering what on earth a mirliton (a MEL-a-tahn, DAHlin')was. Then I read the recipe for scalloped mirlitons and the penny dropped. Chokoes!!!!! These are chokoes!!! 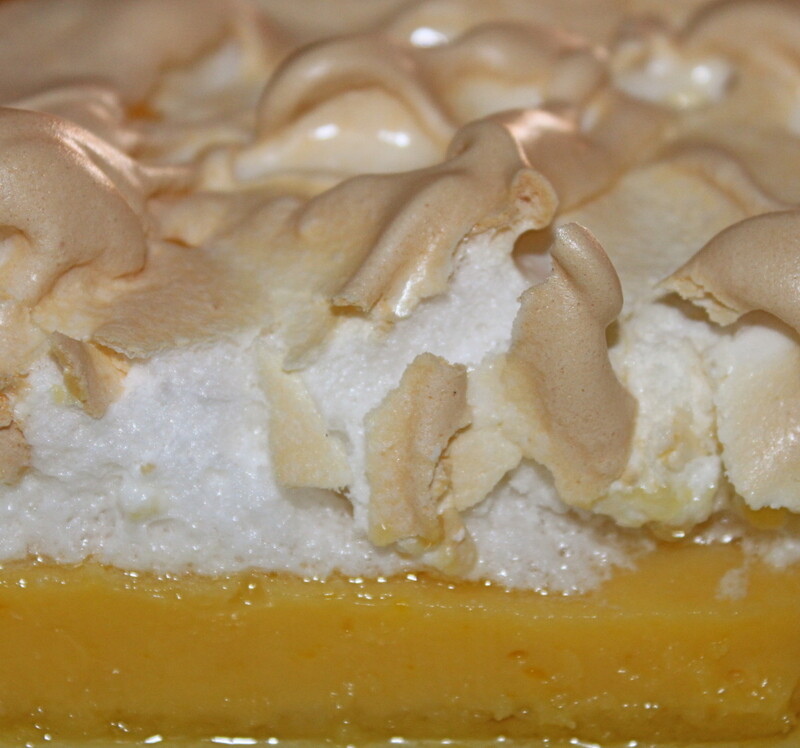 !My great aunts used to make scalloped chokoes. They grow wild all over the place where I live, we cut them down, pull them up and they grow back even stronger than before. 5* for making me laugh so much trying to pronounce them. Don't think I've ever seen mirlitons before. They look yummy. Thanks for entering the What's for Squidinner contest! Good Luck! Thanks for entering the What's for Squidinner Contest! Angel blessed your lens for you! I've seen mirlitons, but have never cooked them. I'd like to give 'em a try, though! Welcome to Culinary Favorites From A to Z. Squid Angel Blessed. Mirlitons have been a family favorite for as long as I can remember. I recommend that everyone try some stuffed Mirlitons at least once because then everyone will know what at delicious dish this can be.